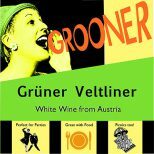 This young fresh perfectly vinified Gruner Veltliner is produced by master winemaker Meinhard Forstreiter. Fresh, dry, “zippy” with loads of healthy grape flavors and acidity that make one think instantly of green apples and citrus fruits, this lovely wine is a great aperitif and a great companion to all casual meals where being with friends and great conversation are the most important part of the meal. Drink up! The nose of this wine brims with cool-ferment peardrop notes. The palate follows with lemony freshness and a dry, easydrinking style. It is made for uncomplicated but lasting refreshment.